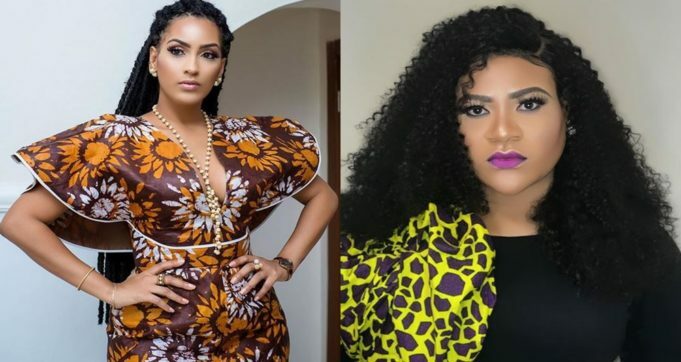 The war of words between Nollywood actress, Juliet Ibrahim and up-coming actress Nkechi Blessing Sunday continues on social media after the Blessing called Juliet an idiot for commenting on her post. It all started yesterday when Nkechi Blessing Sunday Lamented on Instagram that her colleague, Comedian Arole gave her a very hot slap on the set of a movie which left a mark on her face and she had to tell the director to cut for her to take care of herself. Juliet Ibrahim reacted to this by admonishing her that she should have continued with the scene as a professional this apparently struck a nerve as Blessing replied Juliet and called her an idiot in the process although she took down the post yesterday.